Chocolate cake, with chocolate peanut butter frosting. I was going to make a peanut butter mousse for the filling but realized I didn’t have most of the ingredients I needed, boourns. Next time! While these cakes were baking, they had the absolute best smell. Maybe from a combination of the whole wheat flour and new cocoa. I almost died. Literally. I could smell that the small ones were done so walked in to the kitchen to get them out of the oven and slipped on the tile and practically smashed my head open, derp. At least I was right that they were done. You can’t really tell by these pictures, but the cake itself was such a deep dark black. These little guys were just sittin’ there, on the cooling rack, looking all seductive-like. Staring at me with their soft interiors and gently whispering my name. I obviously had to eat one. It was divine. Cute and shiny. Super moist, too. The fully assembled cake, I must say, was amazing. The subtle hint of peanut butter in that satiny smooth frosting was ridiculously good. I’m pretty sure someone had 3 pieces after dinner tonight. That one speck of cake in the icing there is really bothering me. DAMN YOU CRUMB! Oh well. It’s not like this is a fancy shmancy cake. If I took the time to make this fancy shmancy though, oh dear mother of pearl would it be a classy cake. Preheat your oven to 350 degrees F. Butter and line two 8″ cake pans with parchment paper. In the bowl of an electric mixer with the whisk attachment, combine the flour with the sugar, salt, cocoa and baking soda. In a separate bowl mix together the buttermilk, oil, coffee, vanilla, and eggs. With the mixer on medium-low, add the liquid ingredients until fully incorporated. Make sure to scrape the bottom of the bowl. It will be a very liquidy mixture. Like a really super thick hot chocolate. Pour into the prepared pans, and bake for about 20-25 minutes or until a toothpick inserted in the middle comes out clean. 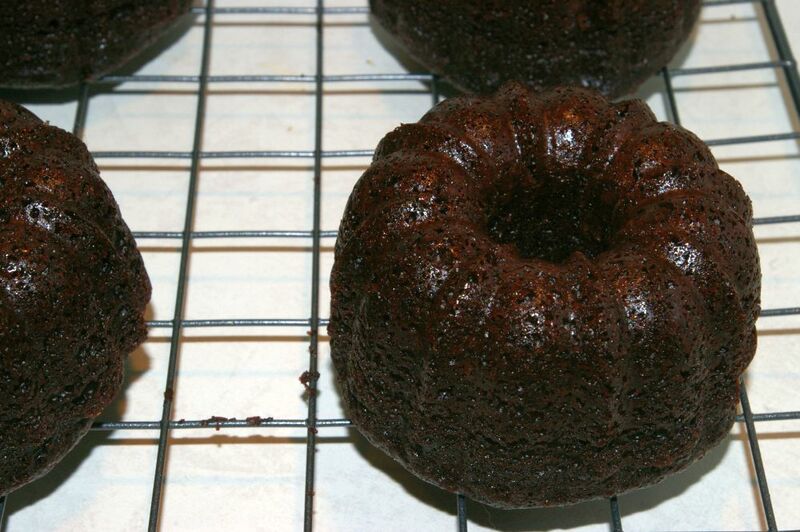 Let the cakes cool in their pans for about 20 minutes, then turn out onto a cooling rack to finish cooling. In the meantime, make the frosting! Combine the butter, icing sugar, and cocoa in a food processor or blender. While that’s running, add in the liquid ingredients until smooth. Then add the peanut butter and blend til smooth. You can use a regular mixer for this but you’ll end up with a more fluffy frosting, not a satiny smooth one. And that’s fne too! Once the cake has cooled, split the layers into two, or leave them for just a two layer cake. I had to split my one layer since I only baked one layer (confession: I only have one of each of all of my baking pans 😦 boooo). Then divide the frosting up equally depending on how many layers you have. You can ice the sides if you want, but you don’t have to. 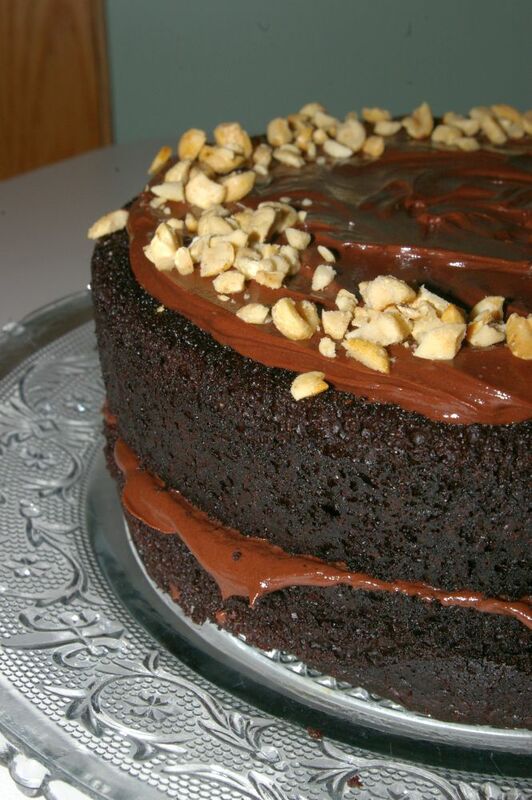 Sprinkle on some chopped peanuts, or coat the sides of the cake for a more elegant look with a smooth flat top. Pretty! This entry was posted in Cake, Delicious things I think are pretty delicious and tagged chocolate cake, chocolate+peanut butter, creamy desserts, easy, ohmygodit'sgood. Bookmark the permalink.